Deleted Scenes – Go Beyond the final cut of the movie with scenes you didn’t see in theaters. 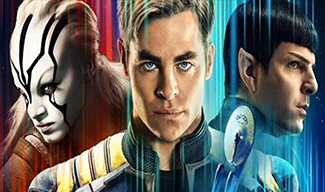 Beyond the Darkness – Meet visionary producer J.J. Abrams, director Justin Lin and co-writers Simon Pegg and Doug Jung as they discuss the inspiration for the Star Trek Beyond storyline and how it came to life. Enterprise Takedown – Experience edge-of-your-seat action and see how a shocking attack destroys the USS Enterprise. Divided and Conquered – Learn how filmmakers pushed the boundaries in Star Trek Beyond by forcing the Enterprise crew into their most challenging situations yet. A Warped Sense of Revenge – Meet Star Trek‘s newest villain, Krall, as actor Idris Elba reveals the backstory behind his character’s terrifying ambitions. Trekking in the Desert – Go on set to Dubai and discover how its futuristic architecture became the foundation for the most innovative Starbase yet. Exploring Strange New Worlds – Tour the incredible production sets of Star Trek Beyond with director Justin Lin. New Life, New Civilizations – See how special effects designers met the challenge to create an unprecedented 50 new alien species for the film to celebrate Star Trek‘s 50th Anniversary. To Live Long and Prosper – Journey through the past 50 years of Star Trek with J.J. Abrams and the cast as they reflect on the evolution of this iconic sci-fi series. For Leonard and Anton – Watch a touching tribute to the legendary Leonard Nimoy and beloved crew member Anton Yelchin. Gag Reel – Join in on the fun with this hilarious gag reel of on-set bloopers.